Commercial drain cleaning and power rodding services are no challenge for Fox Valley Plumbing. Our experts will professionally clean and power rod all of your commercial, institutional and industrial drains. Keeping your drains flowing well and in good working condition, is an important part of your business operation. Not only can clogged and backed-up drains present health and safety concerns, it is key to passing inspections and avoiding costly repairs and potential litigation. Our skilled professional plumbing technicians have years of experience, expertise and use state of the art equipment and products to perform professional sewer services. Our comprehensive services can have your sewer and drain lines back in great working order safely and efficiently. 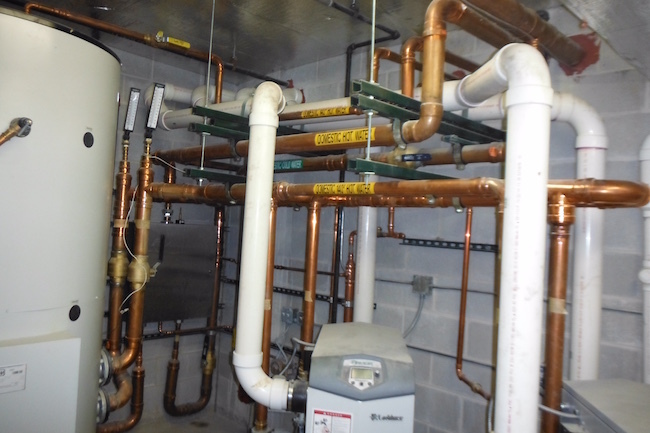 A few of the commercial drain services that Fox Valley Plumbing offers include rodding and cleaning your roof heads, main sewers, cleaning your commercial kitchen drains and process piping. We clean and rod grease traps, unclog toilets, urinals, floor drains, and sinks. We have video pipe inspection capability and our plumbing techs are highly trained, efficient and experienced at providing this service. Our technicians are fully equipped for underground pipe and utility locating. We service and maintain storm drains, loading dock areas, elevator drains for your commercial needs. Our high resolution cameras in the hands or our experts, will locate your problem with precision. This state of the art equipment takes the guessing out of the equation and leaves us with the accurate information that we need to diagnose your situation quickly. We treat you; your staff, facilities, equipment and property with respect. Our professional plumbing technicians wear shoe covers, tarp work areas and use clean drop cloths to protect your facility and keep our clean up quick and easy. When we are finished with any power rodding or cleaning operation, we clean up after ourselves. We take pride in our work and conduct our operations in a professional manner. We work efficiently and safely. We make a practice of interrupting your operations as little as possible. Our services are effective, timely and confidential. Your business is your business. Our business is making your business flow. Our technicians pay close attention to detail and will have your drain and system issues solved with ease and expertise. Whether your drain issues are caused by build ups of grease or food, root infestation, broken lines or foreign objects in the system, our trained professionals can diagnose the problem and discuss your options for solving the problem. Our plumbing technicians will work quickly to clear the problem up and clean up when we are done. If your business has significant backup or standing water from the drainage problem, ask us how we can help. We offer sewer jetting services to help not only clean up these messes but also help prevent further issues. By choosing Fox Valley Plumbing, you choose the best. Safe reliable, honest, dependable and professional is what you can expect each and every time you use our service. Let Fox Valley Plumbing do all the work and the customer gets a discounted hourly rate with all contracts. We serve Fox valley, Wheaton, Palatine, Schaumburg, Dundee, Bartlett, Elgin, Chicago, Wayne, IL and all areas nearby. Get in touch to know more about the services we offer in your area.